On March 20th, Julian Rojas, a photojournalist, and Damian and Jesus, two students from the University of Malaga, came to speak to us on the subject of immigration to Spain at the Ateneo de Malaga. Rojas is the regional photographer of Andalusia, for one of Spain’s leading newspapers, El Pais. He presented to us his photographic essay on immigration entitled “The Dream of Europe”. The majority of his photographs dealt with the struggles Sub-Saharan immigrants face when they attempt to illegally emigrate to Spain, rather than the stories of Moroccan migrants. Rojas explained that Sub-Saharans were his primary focus as they had a higher chance of staying in Spain, and in the Andalusian region. When we asked him why he decided to undertake this project, his main reason was the proximity of Andalusia to North Africa. The huge inequality from one side of the border to the other, as demonstrated in particular by the large socioeconomic divide between the Spanish enclaves and the cities in close proximity (for example Melilla and Nador, Ceuta and Tetouan) spurred Rojas to look deeper into the issue. 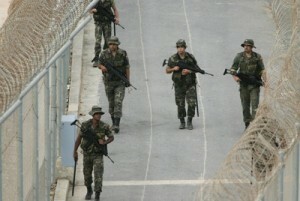 A large part of Rojas’ essay focussed on the Guardia Civil’s treatment of undocumented migrants. If these migrants are caught attempting to cross into Spain illegally, the Guardia Civil rounds them up, and drives them to Oujda, Morocco or to the Sahara desert, where they are left without provisions. Humanitarian aid groups wait at these deposition sites to help the migrants, but it remains a contentious issue, and the treatment of these migrants is currently being debated in Spain. Rojas also recounted the story of a Sub-Saharan woman he had met during his research. She had lost many of her male family members whose boat had sunk during their attempt to cross the Strait of Gibraltar. The Spanish Guardia Civil had deliberately punctured holes in their boat, trying to prevent the migrants from arriving in Spain, but they continued nevertheless, and when their boat submerged from all the water it had been taking on, thirty three migrants, including her brother, son and husband, drowned. Rojas spoke on his experiences working as a photographer with this vulnerable group, talking about his difficulties getting immigrants to talk; those who spoke to reporters often had more problems trying to immigrate. The only negative reaction that he had while doing his research was from the Moroccan police, who detained him in a detention center for fourteen hours. The police told him that they had ways of making him disappear, and he was forced to sign a declaration because of his camera equipment before he was released. Rojas also talked about the Spanish public’s reception to information and images concerning illegal immigration. He said that the same horror stories get repeated over and over again, and now it is only very dramatic stories, such as a pregnant woman or a child drowning on the crossing that captures the public’s attention. While we had been studying the issue of clandestine immigration, and had read accounts from undocumented migrants, I think we were all surprised and shocked by what we saw in Rojas’ essay. We were all confused in particular, by a number of pictures showing people with large white bandages wrapped around their hands. 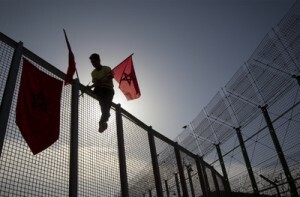 Rojas explained that their hands had been badly cut by the six metre high concertina wire fences that surround Melilla and Ceuta when they tried to climb the walls to get into these enclaves. These militarised double wire fences, built with sharp wire, were constructed in 1996, after the leaders of the nearly created Schengen space identified the need for a strong outer border. Beginning on New Year’s Eve, 1999/2000, climbing these walls has become a popular way of illegally gaining entry to Europe, and many hundreds of people can be found waiting in the nearby forests, waiting for a chance to storm the walls of Melilla and Ceuta. For me, seeing the photos of the hardships immigrants face as well as meeting immigrants living in Malaga, and hearing their stories, really hit home the lengths that people will go to in order to find a better life and better opportunities for themselves and for their families. Rojas’ photographic essay was definitely a learning curve for us all.